mean ol' meany: It is all about the racism. It is all about the racism. The news over the last few days, months, and years since President Dumbass started running for the office, has been nothing but about race. The very reason that this topic has been continually brought up time and time again is because the ideology of the left can never be addressed. The very reason that the ideology of the left can never be addressed is because it is idiotic. Why do you think that NOTHING about Obama's ideology or even his actual past was ever published when he was running for office? No one wants to talk about stupid stuff, so instead we have to talk about the color of folks' skin. It is easier that way because nothing ever gets solved, politicians have job security, and government is allowed to keep getting bigger. Face it folks, we can never have an open debate on anything of substance because there is no one on the left with the intellectual honesty to debate anything. I find it increasingly difficult to even present my arguments about why Democrats are hideous, hate-filled people and need to be run outta town. 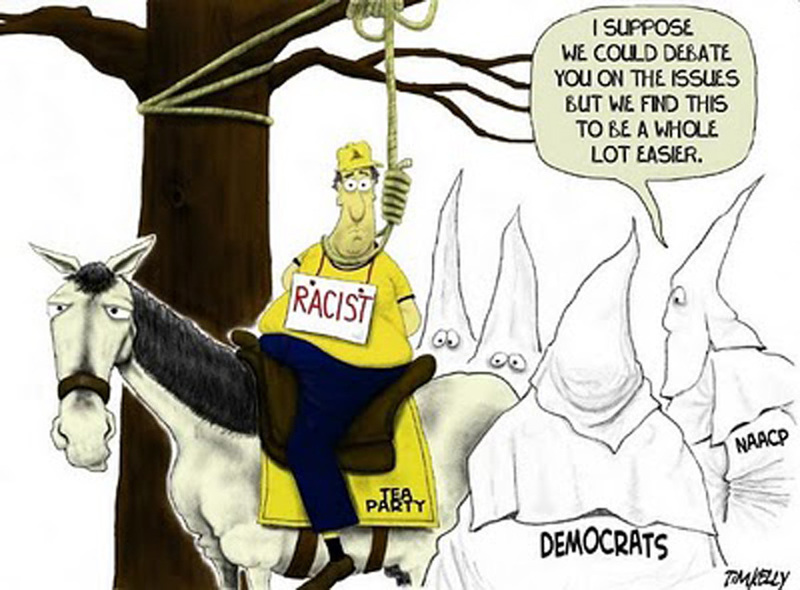 I have always maintained that in order for us to finally ABOLISH racism, we must get rid of Democrats. Then we have to return to the philosophy where we place a stigma on being a deadbeat instead of celebrating loserdom, which we do now. There is no room for "Progressive" ideology in a sane and intelligent world. We all know these things, but somehow the stigma of being evil has been placed on those of us that do not want to give half of our salaries to government to rake fifty percent of it off the top, and then give the rest to people that refuse to work. Idiots then bring up The Bible in their ridiculous defense of their stupid "equality" programs. Just one problem with that, "Progressives" do not believe in G_d, religiosity, or TRUE spirituality. And to actually try to bring up Biblical law when ignoring the HUGE majority of the Bible is really stupid. My friend Vern shared this post yesterday on this very topic. The contradictory thing that I find is that this very topic is telling us to shun those that are evil and to live in a righteous manner. We are supposed to AVOID "Progressives" and only hang with those that are Conservative. It says so in The Bible. Both of those commands contradict "Progressive" ideology. Furthermore, to embrace the tenets of Socialism or Communism, that utterly OUTLAWS religion of any sort sorta shoots holes in ALL liberal ideology. When stating the ridiculous notion that Nancy Pelosi is Catholic, you fail to acknowledge what Catholicism means. You know what it means? Everything that Nancy Pelosi is NOT. She can call herself a "Space Shuttle" if she wants to, but that doesn't make her a space shuttle. OH! YEAH! Nancy Pelosi is an idiot that is NOT Catholic. This is what happens when your decisions are made in a vacuum, which is what is in the "Progressive" melon. Of course, the "Progressive" shall never see the cause and effect of his actions or beliefs. He believes that simply WANTING something to be true shall make it true. "Progressives" are retarded, folks. The current racist snap has been fueled by the "resolution" passed by an organization that is racist by design, the NAACP. Granted, the NAACP has always been a Communist front organization, otherwise the radical Jewish cabal would not have founded it. Wise up, that is who runs that shady outfit and always has. MUD has a great rant about racism and the past. Kathy Shaidle has more on the flap going on with the fired idiot that worked for the USDA or some other wasteful government useless program. Snippets from the liberal Journolist scandal. By the way, with all these attempts to paint the Tea Party as racist, the Barrystream Media simply has to roll out Dale Robertson one more time. Yes, Dale Robertson is a racist Democrat that tried to make a buck by buying the tea party url and has been completely debunked to the hilt, yet Barry's jackbooted thugs in the media keep bringing him back. Here is a fun story, Democrat Congress hits all time low in approval. For some reason, I keep thinking that Congress was at a NINE PERCENT approval before Republicans took over in 1994. But, I could be mistaken on that. Please keep in mind that THIS terrible Democrat Congress is about to jack up your taxes to the levels where they were ten years ago. I simply cannot imagine what shall happen to the economy when that happens. It's not like they haven't already raised taxes on everyone in the country by passing ObamaCare. I guess that it is kinda insulting that the Barrystream Media is FINALLY telling the truth about something that they supported so readily while it was being debated. Oddly, the Republicans were 100% right in all that they said about it. I'm outta here, got work to do, and money to hide from you criminal deadbeat Democrats and your "Displaced Foreign Travelers." And anyone that votes for Democrats, especially black folks, needs to read this book. You're quite right, Congress' approval rating DID hit 9% back in July 2008. I looked back in my blog archives and found a post where Rasmussen had them in the single digits (at the same time as Bush was showing a 32% approval rating). So, now we know at least 9% of Americans are irretrievably stupid. Even if the economy was humming and all the terrorists were dead, I think Congress & Obama would have crummy approval numbers because we are sick of the endless YAKKING ABOUT RACISM! but hell, isn't EVERYONE on the planet a "minority" in some form or another? I'm a blonde, green-eyed part Scandinavian, part Polish adopted by a Dutch-Irish family... I might be the ONLY one in this category... should I start my own political group so I can get FREE STUFF??!! FMP, even though you have new family, dude, your posts are stroking it out of the park lately. Lisa, the one thing that people seem to ignore is that the smallest minority is ONE MAN. The individual is the ultimate minority. Let me KEEP my stuff that I have worked for and earned, since I am the mostest minority-est, since I am only ONE. From the time libtards took control of CONgress in January '07, their approval numbers have gone the way of a turd in a flush toilet (something some libtards still think isn't fair for us to have). Everything they touch, they ruin. Yep, Skunkers, and there is no way to dispute that, either. How stupid does someone have to be to vote Democrat? Surely that must be a rhetorical question. Dang, has anyone else noticed how fast that Morgan Freeman video got revived once I posted it last night? It is on Wizbang this morning, on The Other McCain, and a couple of others. I would like to think that I did that.